Scroll down for most recent blog posts. 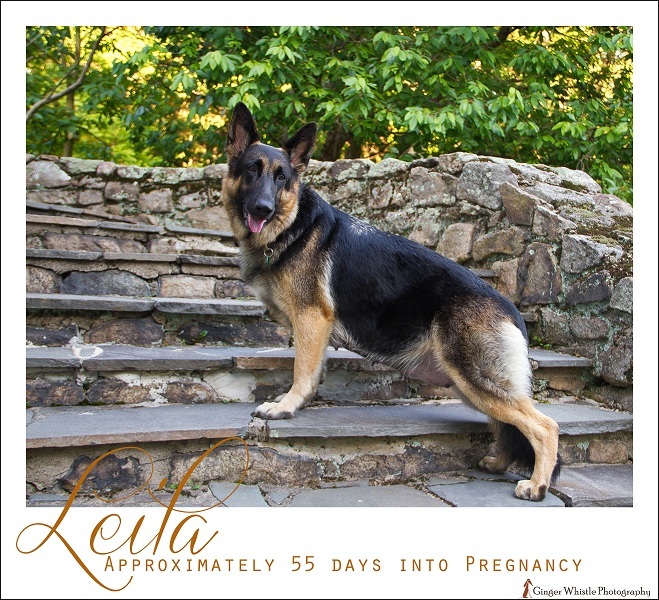 Leila is looking very pregnant! We are taking it easy, as it’s been in the 80’s out these past few days. Short walks and then back in the air conditioning to lie on her favorite sofa! Visited Dr. Mary today for an x-ray. Six puppies total shown on the film, and all look nice and healthy! Leila’s temp was a bit lower than it has been this AM, and is now a bit higher than previous recordings. But she sure is keeping us waiting. She is so much bigger than in the first pic I posted at 55 days. I’ll try to put her in the same position on our steps and take another pic of her tomorrow so you can see how much she has grown… belly-wise, that is. Can’t be much longer now. She looks like she’s going to burst! 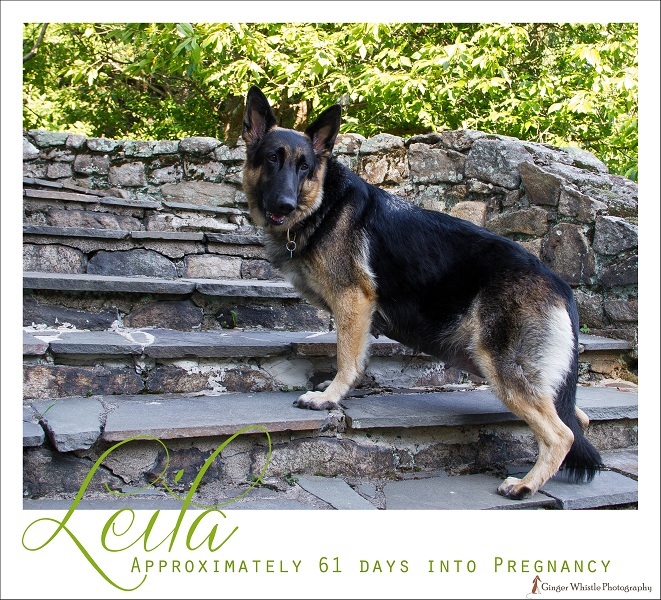 Here is Leila’s 61-day portrait. I tried to place her in the same position as her 55-day portrait. Can you tell how much stockier she is? And she’s so good. I can position her paw and say, “wait, please…” while I take her pic, and she just stays there. So cooperative. 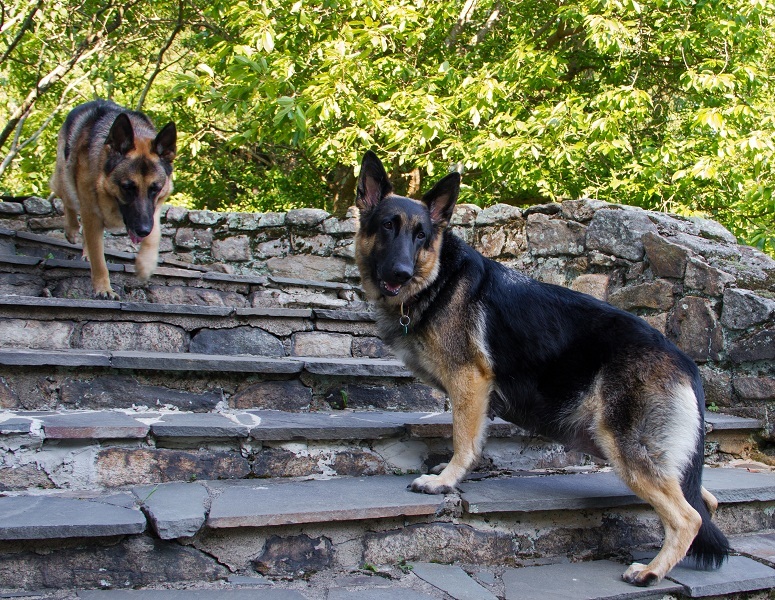 Her GSD daddy, Marcus (ten and a half now), is not as cooperative. I told him to wait at the top of the steps while we took Leila’s picture. But no, he wanted to be in the picture, too. German Shepherd photobomb! Leila’s temp tonight was the lowest it has been since I’ve been recording (I think about 12 days now): 98.8F. She’s been ranging from 99.5-100. That should indicate puppies within 24 hours. Paws crossed. But she is not acting antsy or nervous tonight at all. Tomorrow night? Morning temp: 98.6. Was up all night with her. She was exhibiting some signs of very early labor, and I didn’t want to miss anything. At 5am she fell sound asleep, though, and didn’t want to get up at 8:30 when I did. 11:40am – off to Dr. Mary’s with Leila. I am worried that she was in early labor but not progressing to second stage, so we are going in for a checkup. 2pm – back from Dr. Mary’s. Pups heartrates look good. Progesterone level is 3 which means she is nearing labor. Below 2 is when they usually deliver from what I understand. 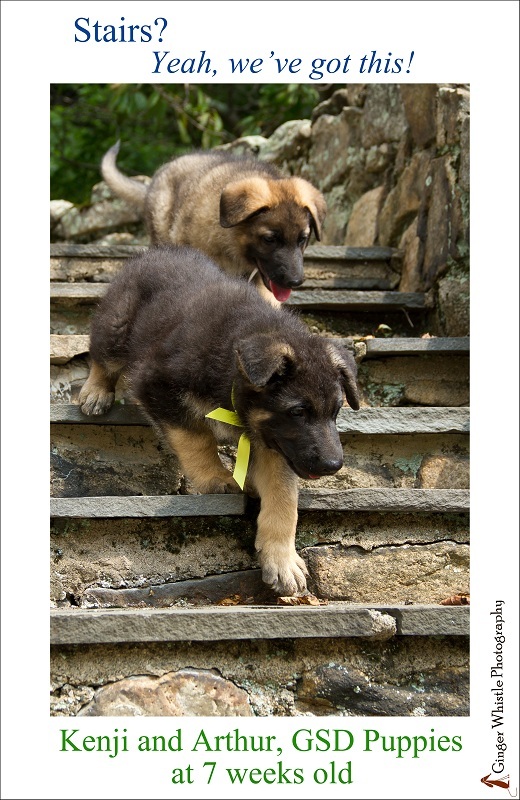 By all accounts – puppies tonight. Everything looks good for a natural delivery to happen tonight. 7pm – Leila and I rested this afternoon as best we could. She’s uncomfortable, and I can’t really sleep because I have one eye open and one ear pricked up waiting for any signs from her. On a positive note, I have six young hens, and found my first egg in their coop this evening. Maybe it’s a sign?? 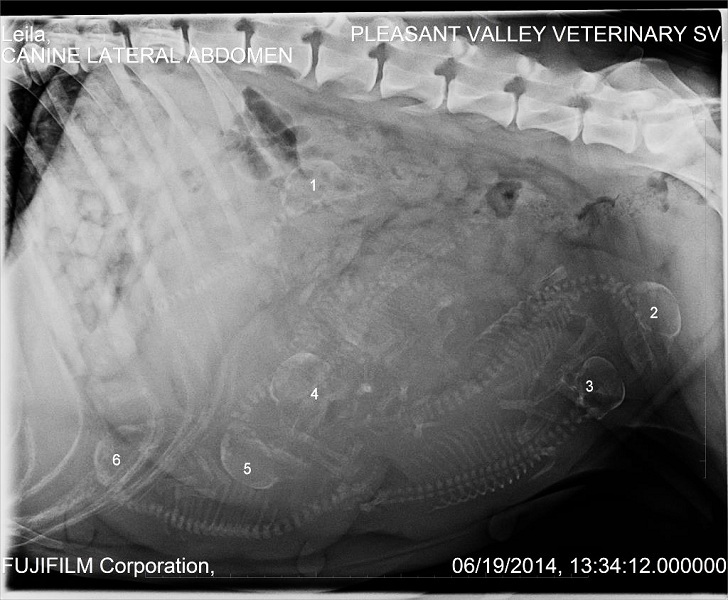 4:15pm – Six puppies born via c-section today. The first puppy, a girl we’ll call Martine, was stuck in the birth canal, and Leila couldn’t push her out. 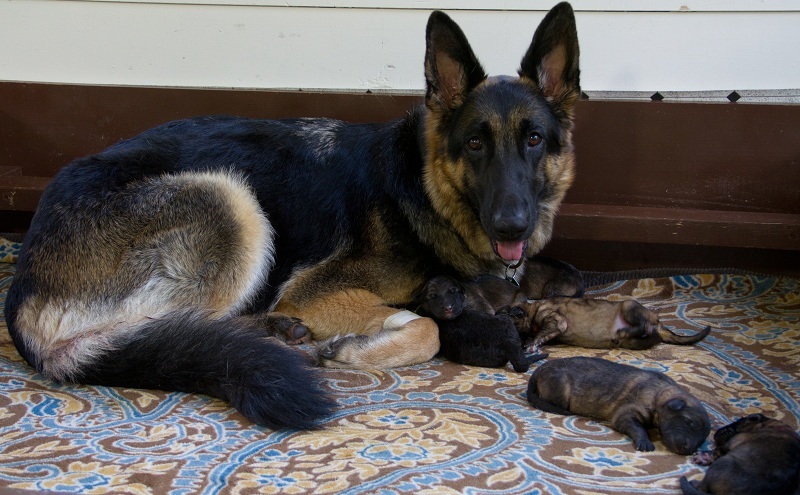 All puppies and the mom are now home and doing great. We are especially thankful to veterinary technician Hannah who didn’t give up on one little girl who just didn’t want to wake up. The little pup was breathing, but only intermittently, and her breaths were more gasps than anything else. She wouldn’t cry, and seemed to just barely be hanging on. Hannah worked on her, rubbing her, massaging her and putting her on heat and oxygen, for over an hour. We’ve named this little puppy after Hannah who saved her. Five pups were over a pound, one was 15 oz. There are 4 girls and 5 boys; all are sables like their father except for one little boy who is black like Leila. 5:40pm – Just got done putting the colored yarn on all the pups. Weighed them and double-checked their sexes. One of the girls is actually a boy! So we have 3 and 3. All are around a pound each. Green, White and Yellow collars are boys; Peach, Red and Hot Pink are girls. 5am: I slept on a couch in our living room, right outside the sunroom, last night, so I could hear any distress calls. The only “distress call” was Leila whining: five of the pups were nursing, and one was crawling away, and she was torn as to what to do. I scooped up the runaway and put him back with her, and it was all smooth sailing after that. My alarm was set so I could get up every hour and make sure everyone was doing well and mom was comfortable (remind me to change the alarm setting on my iPhone to something other than the rooster call; I now want to strangle that rooster). At each check, all the pups were on Leila, most of the time nursing or happily snuggling, including little Hannah whom we were worried about. She is eating like a champ. Of course I’ll be monitoring her weight extra carefully to make sure she’s gaining, but I am so pleased to see that she’s coming around. I tube fed her once last evening, and since then, she hasn’t needed it. I made a mistake yesterday when I said all six pups were delivered via c-section: Martine, who was in stuck in the birth canal, was actually delivered naturally. When Dr. Mary put Leila under for the c-section, she was able to pop the pup right out (helps if the muscles are relaxed). 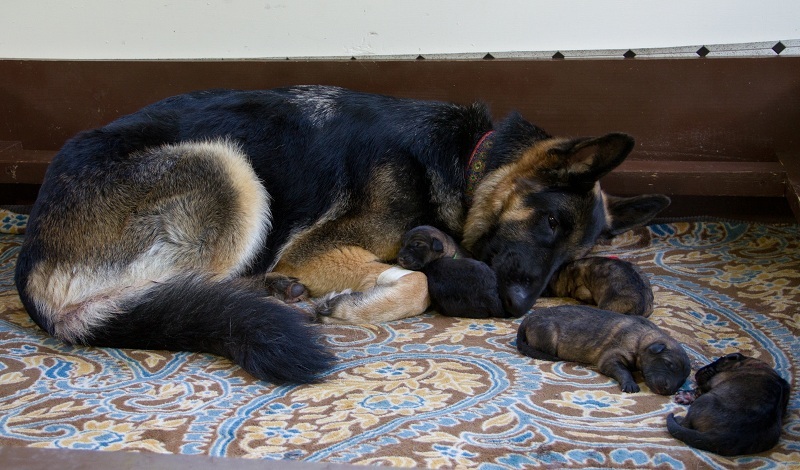 Here are pics of the pups’ first day of life. I cannot imagine a better, more loving or attentive mother. 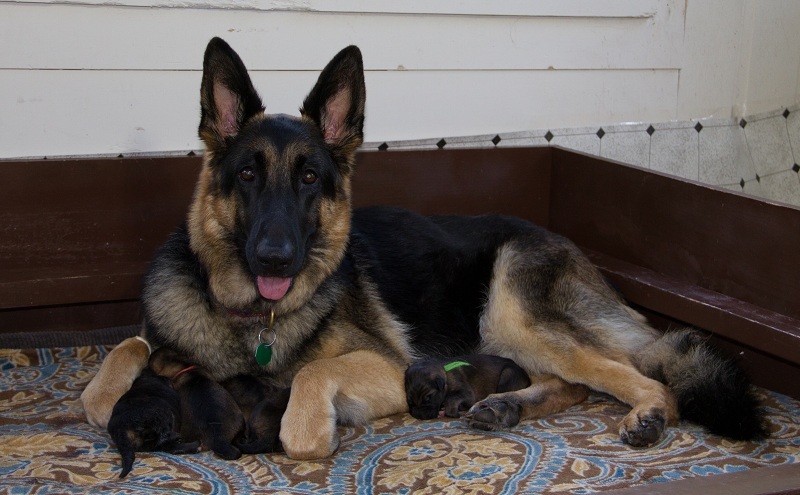 The happiest we’ve ever seen Leila is when she has had puppies to take care of. It’s like she was born for it. We’re not sure we’ll breed her again after this (because she had c-sections with both of her 2 litters), and what a shame. But at least she will have had this wonderful experience. I just put little Hannah on the scale. She was 15oz at birth, the smallest of the pups. She’s now exactly 2 lbs! Over double her weight in less than one week — ahead of schedule in terms of growth. So happy! 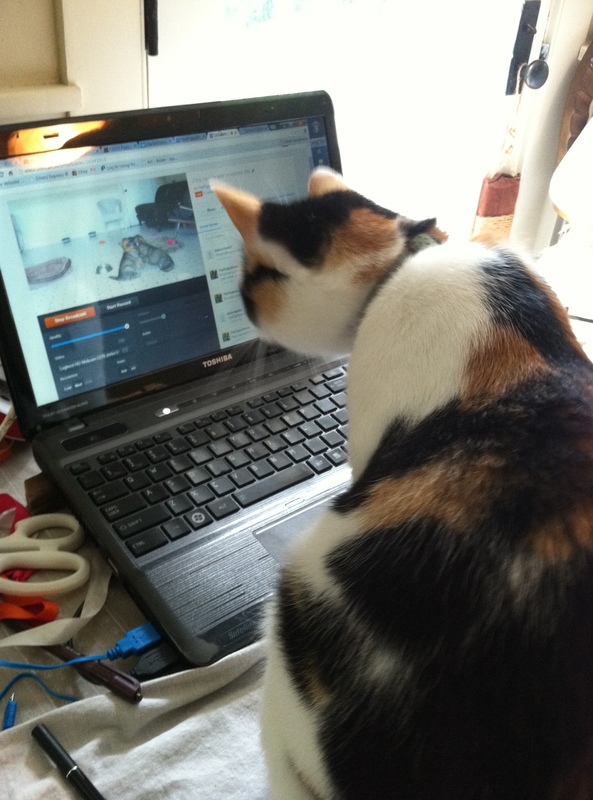 Here is our cat, Nora, sitting on my desk in the puppy room with her back to the puppies, but watching their every move on the puppy cam on my laptop. Cats are unbelievable! The puppies are getting visitors now every day. 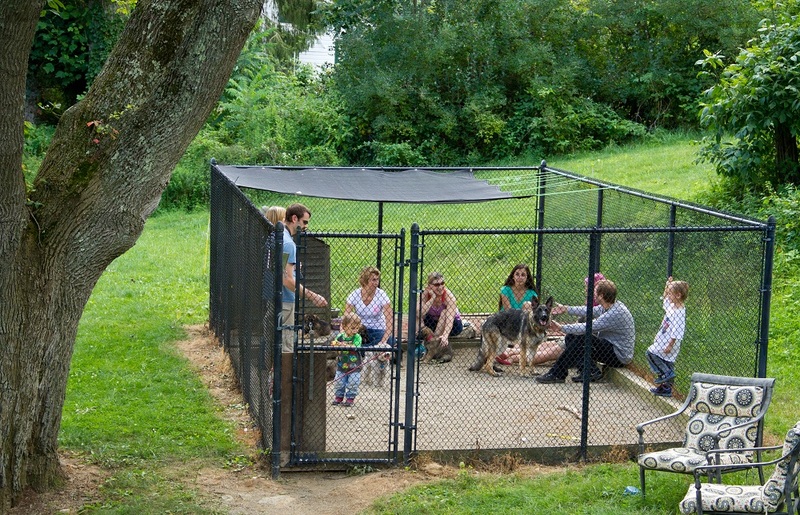 So many of our friends, and the puppies’ future families, want to come and play with them. Socialization! The first puppies are scheduled to leave this coming Saturday the 23rd, and the last to leave will be the following Saturday. We are going to miss them… that’s an understatement.